Trim fat from meat. Cut meat into 6 pieces. In a 3 1/2 or 4 qt. crockery cooker place meat, undrained tomatoes, onion, peppers, oregano, cumin, and garlic. Cover; cook on low-heat setting for 8 to 10 hours or on high-heat setting for 4 to 5 hours. Remove meat from cooker. Using 2 forks, shred meat. 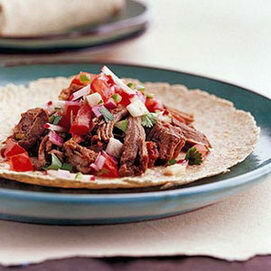 Spoon one-sixth of the meat onto each warm tortilla just below the center. Top with cheese, Pico de Gallo Salsa, and if desired, jicama or radishes and sour cream. Roll up tortilla. Makes 6 servings Prep time: 20 min. Pico de Gallo Salsa: Combine 2 medium finely chopped tomatoes; 2 tbsp. Finely chopped onion; 2 tbsp. snipped cilantro; 1 serrano pepper; finely chopped; and dash sugar. Cover; chill several hours. This was fantastic. I will use it again and again. Used a full can of chipotle peppers and followed the rest of the recipe, came out delicious with just the right level of heat. Pretty good recipe. I have tried it with chicken as well and it is so yummy just leave out the oregano. You really can't substitute chipotle peppers in adobo with a chipotle flavored salsa. The chipotle peppers and adobo have a dark more complex flavor then that of a bright tomato-e salsa. Ultimately, you are completely changing the flavor of the dish.